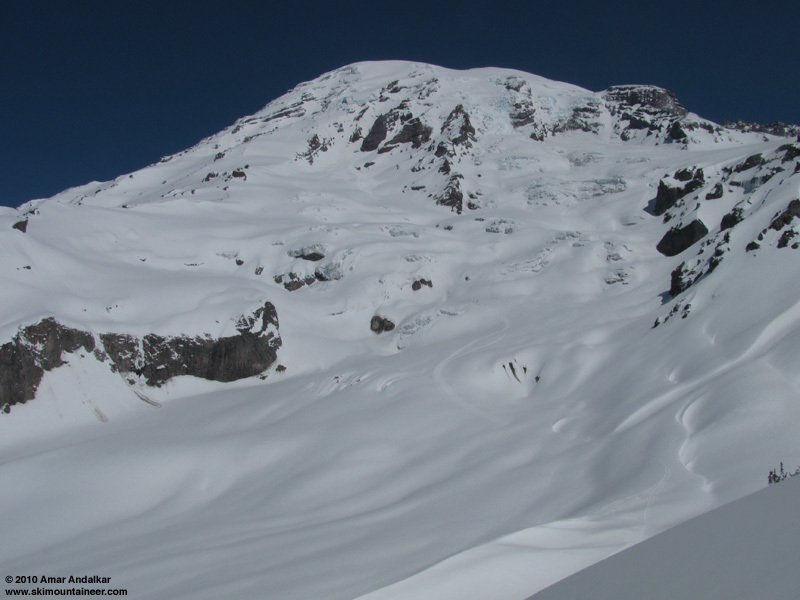 After two straight days of unexpectedly amazing snow conditions on the south side of Rainier (see previous TRs, May 7 and May 8), it was only logical to head back there one more time to try to close out the weather window in style. We had strongly considered heading down to Mt St Helens for Mother's Day, but in the end we settled on the Turtle as our objective. The long snowfield located below Camp Hazard on the standard approach to the Kautz Glacier route, the Turtle extends above the Wilson Glacier from about 9500 to 11500 ft, with a broad open slope of 30-35 degrees forming an excellent ski slope in a stunning location. 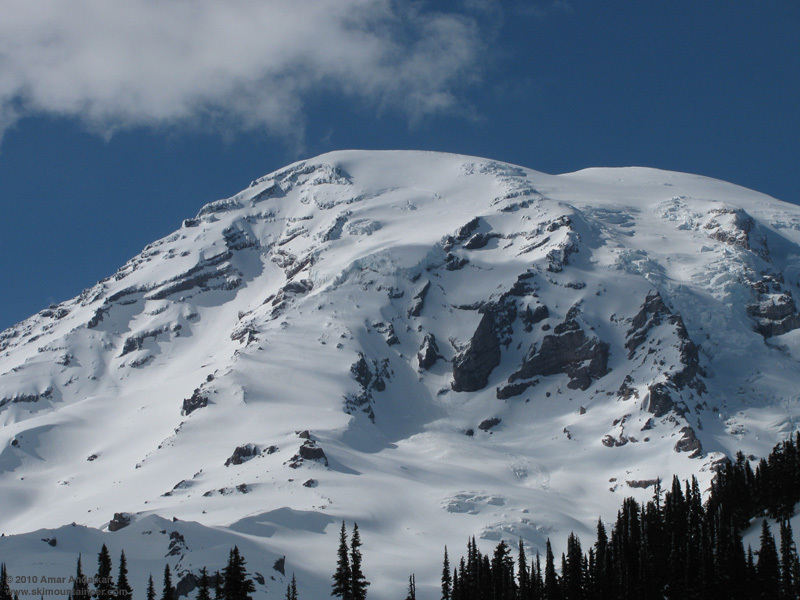 The Turtle and Camp Hazard have normally been the highest points on Mount Rainier which could be legally accessed without getting a climbing permit, although it appears that the rangers would now prefer that parties register and pay the fee since these locations are well above 10000 ft -- best to check and make sure. After chatting with the rangers at the Guide House, our group of three set off just before 10am, skinning up to Glacier Vista and meeting another pair of skiers with the same objective, then informally joining forces for the day. 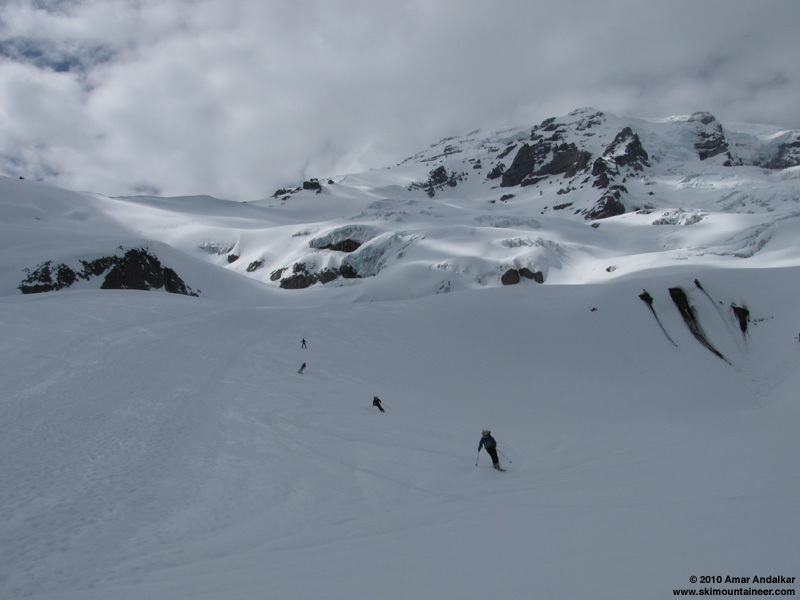 We ripped skins at 6500 ft and skied down the 300 vert to the Nisqually moraine, then re-skinned for the rising traverse across the Nisqually Glacier. Two large groups of Boealps climbers (70+ of them) were practicing crevasse rescue on the first two major sets of open crevasses above 8000 ft, but the traverse across below that was solidly filled-in. We had left glacier gear behind in order to go fast and light, and would not miss it at all today, as the western half of the Wilson Glacier was also very well filled-in. The steep bowls here were an absolute oven in the bright morning sunshine though, but the snow was nicely softened for putting in a steep switchbacking skin track without needing ski crampons. Temps finally cooled off as we reached the more open slopes above the bowls, near 9000 ft, with a SW breeze making it even chilly at times. Onward and upward we went, swapping trail-breaking duties among the now-five members of our group, generally through 2-4" of increasingly wintry snow. Meanwhile the clouds had begun to build too, casting shadows across the Turtle as we neared 11000 ft. Here the snow became wind-packed and firm, those of us who had ski crampons donned them, and those without soon stopped near 11200 ft. Three of us continued on to 11500 ft, at the highest point on the smooth slope, just about 100 ft below the rocks of Camp Hazard, finding a mix of icy windpack and 4-6" of dense powder on the final steepening slope. Overhead loomed the blue ice of the overhanging Kautz Ice Cliff, but our location was well protected if anything had calved off. It was 3pm, and after nearly 6400 ft of gain from Paradise, it was time to ski. With high expectations from the previous two days, the snow on the uppermost Turtle was a disappointment: not bad, but just very average windpack mixed with dense powder, inconsistent and breakable at times, requiring attention and care to avoid a spill, especially in the flat light. Soon the sun returned though, and snow conditions improved as we descended, becoming more and more consistent and consolidated. Much nicer turns as we dropped onto the Wilson near 9500 ft, even proto-corn for some stretches. We soon passed a pair of climbing rangers skinning up on patrol, they were planning to set up camp and hopefully ski the Fuhrer Finger or Thumb (not sure if Monday's weather allowed that). The last rolls on the Wilson became a bit too soft and slushy, carving deep trenches, but stability remained very good with only the most minor sluffs even on steep rollovers. As we reached the Nisqually, we hit the day's jackpot: nicely consolidated corn, including a long stretch of lovely firnspiegel that I had spied on the way up, just beside the cattle-stampede posthole path of the climbing classes. Absolutely ripper snow here, beautiful turns on a smooth crinkling carpet leading back to the moraine. Our group of three managed to exit out back to Glacier Vista without skins, sidehilling up about 150 vert of rising traverse in the well-softened afternoon snow, said goodbye to the others, and then cruised back to Paradise. Somehow, still no glop or nastiness even on this last stretch to the parking lot, a third straight day of that pleasant surprise. Best turns of the day: carving up the firnspiegel on the Nisqually Glacier, with the Wilson Glacier and the Turtle looming above. Another glorious day on Rainier, with fine company, great scenery, and mixed snow conditions ranging from mediocre to magnificent. After 16200 vert in 3 days, the most I've done since last June, I was pretty much beat. It was time to take a breather, and Monday's forecast called for bad weather and more snow! Paradise would end up getting 4" new on Monday morning. SYNOPSIS...A WEAK UPPER RIDGE WILL BRING A DRY DAY TODAY WITH LOW LEVEL ONSHORE FLOW KEEPING HIGH TEMPERATURES NEAR NORMAL. AN UPPER LEVEL LOW OFFSHORE WILL TRACK SOUTHEAST INTO NORTHERN CALIFORNIA ON MONDAY. MOISTURE ROTATING AROUND THE LOW WILL MOVE UP OVER WESTERN WASHINGTON FROM THE SOUTH BEGINNING SUNDAY NIGHT. MOISTURE ASSOCIATED WITH THE LOW WILL CONTINUE TO SPREAD OVER THE AREA ON MONDAY WITH SHOWERS AND COOLER DAYTIME TEMPERATURES. AN UPPER LEVEL RIDGE WILL BUILD OVER THE AREA ON TUESDAY THEN WEAKEN ON WEDNESDAY AND THURSDAY BUT WITH NO ORGANIZED WEATHER SYSTEMS OUT IN THE PACIFIC THE WEATHER WILL REMAIN DRY FOR THE MOST PART THROUGH THE MIDDLE OF THE WEEK. SUNDAY...MOSTLY SUNNY. FREEZING LEVEL 5500 FEET. SUNDAY NIGHT...MOSTLY CLOUDY. A CHANCE OF SHOWERS AFTER MIDNIGHT. SNOW LEVEL 4500 FEET. MONDAY...SHOWERS LIKELY. SNOW LEVEL 3000 FEET. MONDAY NIGHT...CLOUDY WITH A CHANCE OF SHOWERS. SNOW LEVEL 3500 FEET. TUESDAY...MOSTLY CLOUDY WITH A CHANCE OF SHOWERS. SNOW LEVEL 5500 FEET. TUESDAY NIGHT...MOSTLY CLOUDY. FREEZING LEVEL 6500 FEET. WEDNESDAY...PARTLY SUNNY. FREEZING LEVEL 8000 FEET. WEDNESDAY NIGHT...MOSTLY CLOUDY WITH A CHANCE OF SHOWERS. SNOW LEVEL 7500 FEET. THURSDAY AND THURSDAY NIGHT...MOSTLY CLOUDY. A CHANCE OF SHOWERS. SNOW LEVEL 8000 FEET. FRIDAY...PARTLY SUNNY WITH A CHANCE OF SHOWERS. SNOW LEVEL 8000 FEET. FRIDAY NIGHT AND SATURDAY...MOSTLY CLOUDY WITH A CHANCE OF SHOWERS. SNOW LEVEL 7500 FEET. Spectacular!� Great reports, you really took advantage of the weather window! I'll definitely have to keep the turtle in mind. Care to offer any observations/speculation on Fuhrer Finger conditions? I really have no idea what snow conditions in the Finger might be, since another storm dumped nearly 1 foot more snow on Monday. I skied Ingraham Direct yesterday, and snow conditions were horrible breakable crust between 12500 and 11200 ft on a mostly ESE aspect, but better below that. The upper Nisqually Glacier and Finger face mostly SSE above 10500 ft (and south below that), so conditions may be similar to that (or may not). Thanks Amar. Your pics are a big help. As for snow conditions, we'll likely be finding out on Saturday.